I just finished responding to work e-mail that was sent to me today. Well, not all of it. I have 156 emails from TODAY in my inbox. That's not counting the 89 from today that are in my deleted folder and another 20-plus that I filed in Outlook folders. What did people do at the office before e-mail? I so can relate. Thinking of you! I like the above quote. It describes exactly how I feel about taking classes! But I'm done now, so the quote just seemed perfect to describe how I feel. Phone and snail mail and it didn't follow you every where. Today it is so different. I have a total of 2576 e-mails that need sorted, deleted and/or filed. Lord have Mercy! I need a few more hours in my day these days! P.S. 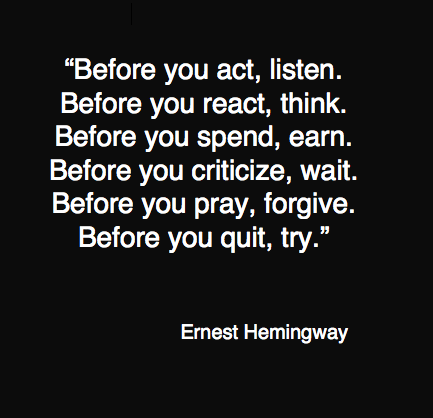 Do you think Papa (Ernest Hemingway) went through that list before he did himself in? Thoughts of an English teacher! I don't know how technology saved ANYONE any amount of time. And 155 of those were from me, right ;) I feel your pain sister friend!